Japanese sumo wrestlers and a referee at the garden of British engineer and photographer William Kinnimond Burton (1856–1899). 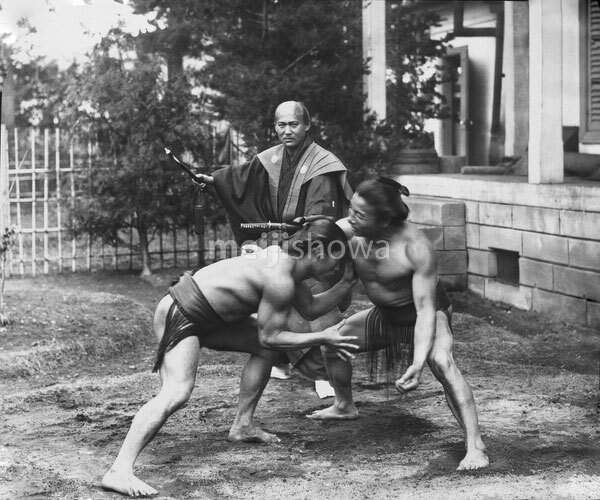 This photograph was published in “Wrestlers and wrestling in Japan,” published by K. Ogawa in 1895 (Meiji 28), the first comprehensive book to introduce sumo to a foreign audience. In 1887 (Meiji 20) Burton was invited by the Japanese government to become a professor of sanitary engineering at Tokyo Imperial University. His achievements became the starting point of Japan’s environmental and sanitary engineering. Burton also designed Japan’s first skyscraper, Ryounkaku (凌雲閣), located in Tokyo’s Asakusa.